This story appeared in the May 23, 2011, issue of Sports Illustrated. Subscribe to the magazine here. At 5:30 a.m. on April 27 in Tuscaloosa, Ala., in a four-bedroom, two-bathroom house at 611 25th Street, Carson Tinker was awakened by thunder. When he peered through his window that faced west, he saw flashes of lightning fracture the dark Southern sky. The bolts held his eyes. That morning Tinker, 21, a junior and Alabama's starting long snapper, attended class and then picked up his girlfriend of 11 months, Ashley Harrison, a senior honors student. The two returned to Tinker's house for lunch, eating leftover ham-and-potato salad that Harrison had cooked for Easter three days earlier then settled into the living room couch to watch The NeverEnding Story. The movie soon bored Tinker, so he took his dog, Josie, a German shepherd mix, and Harrison's dog, B, a black Lab, to a large, grassy field across the street. Tinker hit golf balls; the dogs fetched. This field was one of Tinker's favorite places in Tuscaloosa. Framed by towering oaks, he felt at peace; aside from the occasional bark, the only sound was the wind strumming the leaves. He often called his time in the field with the dogs "one of the highlights of my day." Tinker returned to the house an hour later. After showering he saw that Ashley and his two roommates—Alan Estis and Payton Holley—were riveted to the television. A weatherman declared in a raised voice that a tornado was tearing toward Tuscaloosa. Tinker and Holley stepped onto their front porch, gazing upward, searching for a funnel cloud. All they saw was a dark spring sky. Tinker had planned to move to a neighbor's basement if a tornado was nearby, but he saw nothing. A few seconds later his cellphone bleated. It was his grandfather, Jim Cartledge, calling from Hoover, Ala. "Carson, you need to take cover now!" Tinker and Holley ran inside. What they couldn't see was that a few miles to the west of their house, the most powerful long-track tornado ever in Alabama, an EF-4 level twister with winds of 190 mph, was bearing down on them at 55 mph. Quickly the four students and the two dogs wedged themselves into a walk-in closet in Estis's bedroom. Tinker wrapped his 6'1", 220-pound frame around Harrison. "We're going to be O.K.," he said softly into her ear. The tornado hit 611 25th Street with cruel directness. Cowering in the closet, crouched on the floor, Tinker held Harrison tight. As the winds roared—"It sounded like there was an F-18 in the front yard," Estis would later say—they could hear the walls creak. "I'm scared, Carson," Harrison said. "It's going to be O.K.," Tinker shouted as the house began to disintegrate. "It's going to be O.K., Ashley." Just then Tinker was sucked out of the closet, catapulted into the air like a rock by a giant slingshot and thrown 100 yards into the field he loved so much. He blacked out, concussed, and when he opened his eyes moments later he couldn't recognize anything. The oak trees had vanished; the house was a pile of rubble on the other side of the road. Ashley was gone. In a suddenly perfect silence, Tinker wandered around the field. He had a broken right wrist, gashes in his head and a large cut on his right ankle. His body moved in slow motion, but with a sense of urgency. "Ashley, where are you?" he screamed. "Ashley!" For at least 10 minutes, before his roommates, who were mostly unharmed, found him help, Tinker stumbled in circles, searching for the girl that he had been with almost every day for the past year. "Ashley," he screamed, "where are you?" 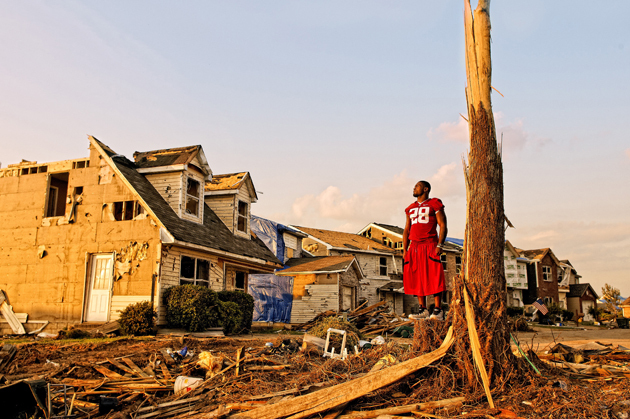 How do you tell the story of the deadliest tornado in the history of Alabama? As of Sunday, 41 were confirmed dead—including six students from the University of Alabama—and hundreds injured in Tuscaloosa and Tuscaloosa County alone. 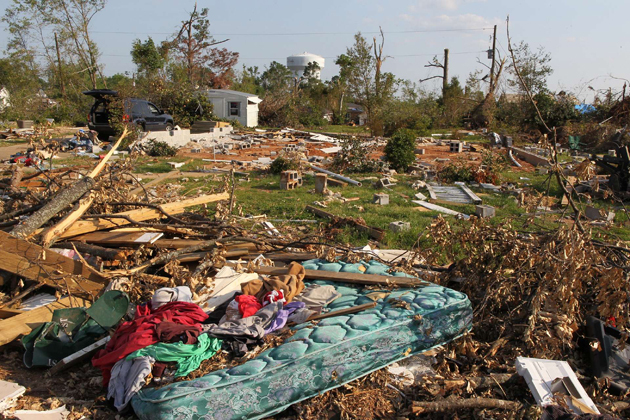 (A total of 238 people were killed by more than 60 tornadoes that ravaged the state on April 27.) But these raw numbers can't begin to account for the damage. Nearly every resident in the town of 90,000 has trouble sleeping, and when they do close their eyes and drift away, most are tormented by please-God-wake-me nightmares. I live in Birmingham and from my front porch saw the same twister that decimated Tuscaloosa pass five miles to the north. Debris with Tuscaloosa markings—letters, business cards, pictures—fell in my neighborhood, which is 60 miles from T-town. My dreams, too, have been haunted by the images of destruction and despair I've seen in Tuscaloosa, where I taught a sportswriting class at the university this spring. None of my 14 students were physically harmed—though it took days of frantic texting and e-mailing to verify that as cellphones and Internet connections failed throughout Alabama—but the storm continues to swirl inside of them, deepening their emotional scars. "The tornado cut a six-mile path through here that was a half mile to a mile wide," says Tuscaloosa mayor Walt Maddox as he looks at the ruins of a grocery store where his mother took him shopping as a boy. "Fifteen thousand people here were in the path of this thing. The enormity of it all can swallow you." The most iconic structure in the state, Bryant-Denny Stadium, looms in the distance, dominating the battered T-town skyline. The tornado passed just a half mile south of the campus. "If it hits us," says Anthony Grant, the Crimson Tide men's basketball coach, "this place would have been shut down for several years. Who knows? Maybe longer." Tuscaloosa is among the most sports-obsessed cities in America—greetings of "Roll Tide" are as common here as a simple "hello." Athletics will play a special role in rebuilding it, brick by brick, life by life. 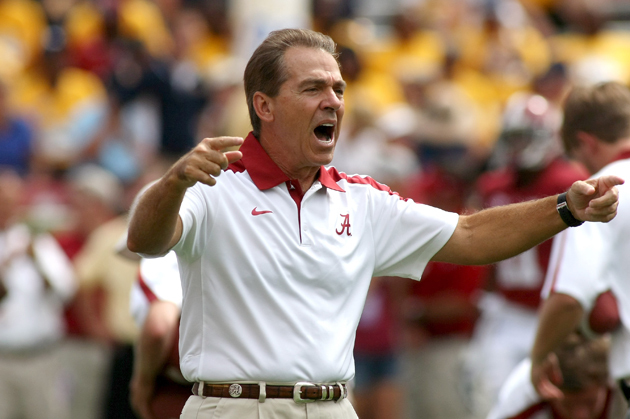 "We can create a psychological escape for the people of this town," says Nick Saban, Alabama's football coach. "They have a great passion for sports, and we'll be there for them." The grainy images flickered on the concrete wall of the cavernous Alabama National Guard armory in Northport, five miles northwest of Bryant-Denny. Across the floor were rows of cots, where hundreds of National Guardsmen and Guardswomen—mostly from Alabama—had slept since the tornado ripped through Tuscaloosa. A unit from Mobile was relaxing—sleeping, reading, listening to iPods or watching highlights of Crimson Tide football projected on to the wall. In one clip, 'Bama was scoring a touchdown against Auburn; in another Bear Bryant was prowling the sideline; in another the Tide was winning the 2009 national title. Sweet Home Alabama played in the background in a seemingly endless loop. "The troops here are tired," said Staff Sgt. Greg Stocks, 54, a native of Fayette, Ala. "We put in long hours, 12-hour shifts. I went through Hurricanes Katrina and Rita, and this is as bad as it gets. It's a horrendous tragedy. But hearing that music and seeing those highlights lifts us up. This is Roll Tide country. Like most of the people in here, I've been an Alabama fan since even before I was born." 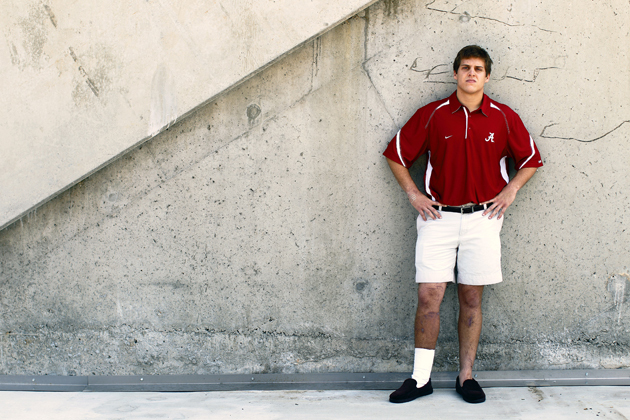 As Stocks spoke he looked into a far corner of the drill hall, and what he saw caused a smile to stretch across his sunburned face: A former Alabama football player had just entered the room. The player shook hands, posed for pictures, signed tan-colored patrol caps. Then he did something that caused all 150 troops in the room to lean in close: He shared his story. At 5:10 p.m. on April 27, Javier Arenas, like many Tuscaloosa residents, was watching the local news as the emergency sirens blared. Arenas, a senior punt returner and defensive back on 'Bama's national title team in 2009, was a rookie for the Kansas City Chiefs last year after being drafted in the second round. Like many former Crimson Tide players, he lives in T-town in the off-season because, he says, "it's where I've experienced the best memories of my life. "This will always be home to me," says Arenas, a native of Tampa who set an SEC record for punt return touchdowns (seven) in '09. "Alabama football is a religion here. We don't have any professional teams. You can walk into any living room in the state and they'll have either an Alabama logo or an Auburn logo. The devotion of the fans is unlike anything I've ever seen anywhere." Arenas was alone in his living room at 1427 Gardenia Avenue, just two blocks from the intersection of 15th Street and McFarland Boulevard, which residents would soon refer to as Ground Zero. A TV weatherman said that the tornado was blowing through downtown, four miles from Arenas's three-bedroom house. Then he looked out the window, and what he saw left him breathless: There, less than a quarter mile away, was the twister, barreling straight toward him. Immediately he called a childhood friend, Stephen Adkins, who was traveling on his baseball team's bus in Georgia. "I can see it!" Arenas yelled. "Stay calm," replied Adkins. "Go to your bathroom and get in the tub. Do it now!" As Arenas sprinted to his bathroom, Adkins stayed on the phone; he could hear the wind start to blow through the house. A moment later, as Arenas clutched the side of the bathtub with all his strength, he told his friend, "I think my car just blew into my living room." Then the phone cut out. "I've known Javier since we were six years old and I've never heard him so scared," says Adkins. "I was in complete panic. I probably called him 100 times in the next hour." Arenas prayed in his bathtub. Please God let it be over. Please let it be over... . And then it was. The tornado passed. Arenas, his heart jackhammering, walked outside. 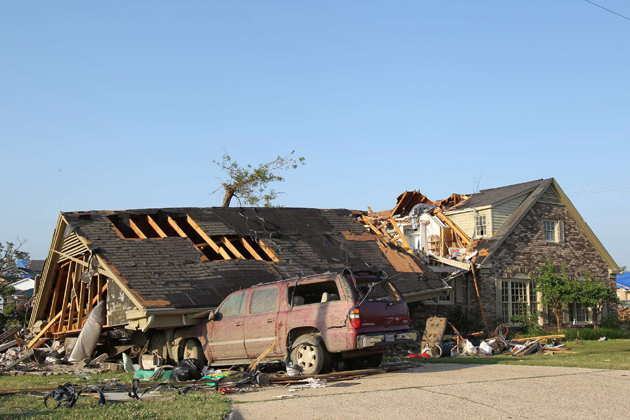 Several houses in his neighborhood were flattened. A few women ran down his street screaming. He meandered, as if in a dreamlike fog, to his favorite place on 15th Street, a Smoothie King, where he had always stopped after his workouts. The building looked as if a fist from the sky had reached down and smashed it. But as he walked closer to where the Smoothie King had stood 10 minutes earlier, he heard two women buried in the store's rubble, begging to be rescued. As Arenas drew closer to help, he was overcome by the noxious smell of gas. He ran to a fireman, told him of the women, and within minutes they were pulled to safety. Not knowing where to go, Arenas then walked to a mall, which seemed to be untouched. He sat on a curb for nearly an hour, trying to process what he had just seen. What he didn't know—but would learn later—was that three bodies lay on the mall's roof, thrown there by the storm. "You couldn't have made a tornado that big even in the movies," says Arenas, standing in front of what remains of his house 10 days after the tornado, the putrid smell of dead animal and rotten food heavy in the air. "Afterward everyone was walking around like zombies. It's hard. I'm trying to get my head together. It's going to take time." 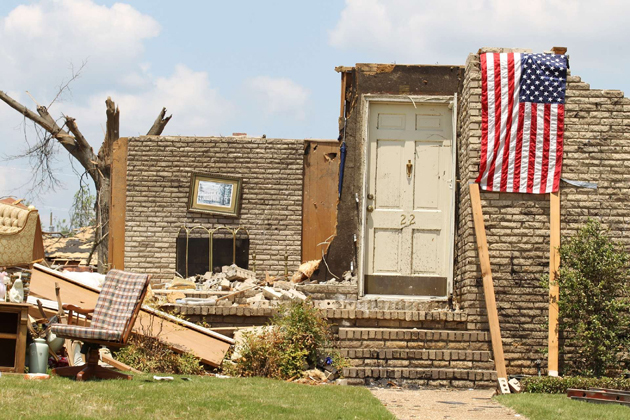 A day after the tornado struck, Arenas drove 11 hours to his home in Kansas City, wanting to leave the destruction and heartache behind. But he couldn't. So he steered his 2008 black Denali to a Sam's Club, purchased $1,600 worth of necessities—bottled water, baby food, toothpaste—and returned the next day to Tuscaloosa. He tweeted that he would be giving away his supplies outside of a mall on McFarland Boulevard, and within minutes, hundreds of homeless tornado victims surrounded his SUV. "I never realized that as a former Alabama football player, I can bring a smile to someone's face just by hugging them," says Arenas. "That's why I've been going to see the National Guard guys. I'm just trying to brighten their days." "I can't emphasize enough how much seeing Javier boosts the morale of everyone here," says Sergeant Stocks, watching Arenas sign more autographs. "I guess you could say that's the power of Alabama football during this unprecedented event in this state." Kayla Hoffman may have been the happiest student on the Alabama campus on the afternoon of April 27. Eleven days earlier in Cleveland, Hoffman, a 5'1", 120-pound senior, had led the Crimson Tide to the NCAA women's gymnastics title. On the final day of competition, Hoffman had the routine of her life, earning a 9.95 on the floor exercise—the highest score in the team competition at nationals—as Alabama edged UCLA for the championship. Then, on the morning everything changed in T-town, Hoffman was named winner of the Honda Award, given to the top female gymnast in Division I. That afternoon she received dozens of congratulatory texts, voicemails and tweets. Around 4 p.m. she jogged around campus with her boyfriend of three years, Michael Hughes, a decathlete on the Alabama track team. Then Hughes drove to his apartment in Northport, a mile north of Tuscaloosa, and Hoffman went to her second-floor off-campus apartment at 1509 6th Avenue, which sits a football field away from 15th and McFarland. She showered. Moments after finishing, she lost power in her apartment. Hoffman heard warning sirens, but thought little of it; they had gone off dozens of times in recent weeks and every one proved to be a false alarm. But as she dressed she received a text from a teammate who lived in a ground-floor apartment only 200 yards away: Hurry, come here. It's coming. It's huge. Hoffman grabbed a hairbrush and stuffed nail-polish remover and cotton balls in her purse—she had hoped to do her nails while waiting out the storm—and rushed down her stairs. She walked into the suddenly cool late afternoon and started to run to her teammate's apartment. After taking three or four steps Hoffman looked up: The nearly mile-wide tornado was right in front of her. Several cars were flying through the air not more than 30 feet away. She turned to run to back to her apartment, but she was pummeled by flying objects: glass shards, pieces of wood, rocks, clumps of mud. She had no time. Gripped with fear, Hoffman pounded on the door of a first-floor apartment in her complex, number 104, screaming for help. No one answered. Still being slammed by debris, she crouched in the door frame, put her purse over her head and scrunched herself into the smallest ball she could. The wind blew so hard that the stones in her stud earrings flew away. Insulation battered her eyes and mouth as the tornado slashed through her building. Three miles away, Hughes was horrified when he heard news reports that 15th and McFarland had been hit hard. He needed to make sure his girlfriend was alive. He left his apartment, but quickly got stuck in traffic. A mile and a half from where Hoffman had crouched in a door, he hopped out of his car and began sprinting toward her apartment. "It was easily the fastest I've ever run," says Hughes. When he arrived, the facade of the complex was virtually gone and Hoffman was nowhere to be found. In the midst of his desperate search, Hughes stepped on a nail, puncturing the bottom of his right foot. 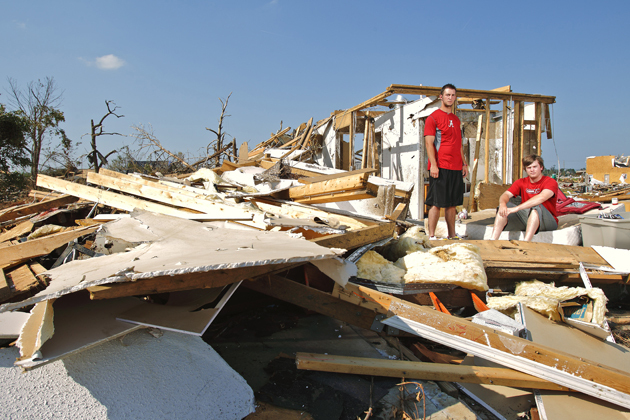 When he heard from a friend that another tornado was coming, Hughes ran another mile to Coleman Coliseum and sought shelter in the track-and-field locker room, located in the basement. His foot was a bloody mess, his sock now red. Breathing heavy, frightened, Hughes had a trainer patch up his foot. Minutes later the all-clear was given and Hughes sprinted back to Hoffman's apartment, his foot throbbing with every stride. He pounded on doors. No one answered. He ran to another complex. "Is Kayla Hoffman here?" he yelled into one apartment after the next. Finally, after what felt like a lifetime, he found her in the apartment of another gymnast. Hoffman was bloodied—she had suffered a six-inch cut on her right calf and had even found a piece of glass four-by-two inches long lodged in her sports bra—but alive. The two embraced, tears leaking from their eyes. "I just couldn't let go of Michael," Hoffman says. "I thought I was going to die. I was almost sure of it. And seeing him was like nothing I've ever experienced." The two then walked out onto 15th Street and looked toward campus. The sun was setting now, blushing the western sky pink. In the distance Hoffman saw the silhouettes of mangled metal, broken trees, splintered houses and rubble piled 15 feet high. Arms around each other, their eyes still dewy, Hughes said softly to his girlfriend, "It's gone. It's just all gone." At 5:08 p.m. on April 27, Josh Rosecrans, a catcher and relief pitcher on the Alabama baseball team, peered out a window. He lived at 308 17th Street East, near a small lake that was less than two miles from Bryant-Denny Stadium, and his eyes bulged at what he saw: The tornado was on the other side of the water, ripping up power lines, causing sparks of blue light to pop in the black sky. Immediately, he called his father, Levi, in Edmond, Okla. "What do I do?" he asked. "Get a mattress now and get into the tub," his father said. "Now!" Rosecrans and his roommate, pitcher Nate Kennedy, hurried to a bathroom that was in the center of their three-bedroom house and pulled a mattress on top of them. Taped on the bathroom mirror was a piece of paper with the Biblical passage Psalm 121: 7: The Lord will protect you from all harm; He will protect your life. The two jumped into the bathtub. Their ears popped. Then the storm hit, the shrieking wind as loud as a jet engine. "Nate, there went the roof," Rosecrans yelled, holding on to the mattress with all his might as Kennedy lay on top of him in the fetal position, also gripping the mattress. "Hang on, man, just hang on." For 30 seconds mud sprayed everywhere, even flying into the bathtub and covering the two players. "This could be it for us," Rosecrans said. "If we go out, we go out together." Then, a few seconds later ... silence. Rosecrans poked his head out: Their house had crumbled—the only walls left were those of the bathroom they were in—and Rosecrans could see the sky. "Oh, my God," Rosecrans said. "Everything is gone." The two lifted themselves out of the bathtub—the Biblical passage was still taped to the mirror—and ran through their decimated neighborhood, checking to see if anyone was injured. They heard a male voice shout, "I'm over here." The players sprinted to the voice and for several minutes pulled wood and debris from a shattered house. They reached their neighbor; he was drenched in blood from a head wound. They rushed him to a nurse who was in the area; she took the man to a hospital, where he survived. The next day Rosecrans and Kennedy walked to the house of teammate Jon Kelton, who lived less than two miles away. Several oak trees more than 150 years old and 70 feet tall were strewn across his yard, but Kelton was uninjured. As the hours passed, more baseball players arrived at Kelton's damaged house, all helping to remove debris. Three other towering oaks had fallen on the house across the street from Kelton's, killing the three students inside. With nearly the entire Alabama baseball team standing in Kelton's yard, the family of a female victim arrived. Kelton approached, offering condolences. "Is there anything we can help you find in the house?" he asked. "There is a white dress that we'd like to have," the mother, choking back tears, told Kelton. "We'd like to bury her in it. Could you help us find it?" The 15 baseball players formed a line that stretched from the remains of the house to the street, picking up garments, books—anything salvageable—and then handing it down the line and giving it to the parents. Minutes later Nathan Kilcrease, a pitcher, pulled out the white dress. He gave it to the woman's mother. "Thank you so much," she said, tears running down her cheek. "Thank you." "I wish I could have gone my entire life without having to do something like that," Kilcrease said as he sat in the players' lounge at Sewell-Thomas Stadium on campus last week. "But all we want to do is help. And maybe through baseball we can put a smile, if only for a few hours, on people's faces and make them forget the heartache." Eleven days after the white dress was recovered, on a mild, sunny afternoon in Tuscaloosa, Rosecrans recorded the final two outs in Alabama's 9–0 win over LSU. The crowd of 4,019 at Sewell-Thomas thundered as the team surrounded Rosecrans on the pitcher's mound. Here, for a few sweet moments, all felt normal in T-town. Nick Saban stood in front of his players in a lounge at the Mal Moore football complex two days after the tornado, his voice thick with emotion. "I know you all have seen a lot of things in the last few days and if you have any issues, come see us," Saban said. "I've found through the years that professional help can get you through major things. But we've also got to support the community. We can't just be a team for them on Saturdays. The fans are with us in the best of times, and we have to be with them in the worst of times. Just by your presence and being with them, you can help people." And hundreds of athletes have. Grant, the men's basketball coach, has worked on rooftops all around Tuscaloosa repairing damage. Courtney Upshaw, a linebacker, signed thousands of autographs to raise $25,000 for tornado victims. Carlos Taborga, a tennis player from La Paz, Bolivia, has spent hours acting as an interpreter for Temporary Emergency Services. Barrett Jones, a 6'5", 311-pound offensive lineman, lugged a chain saw around town for a few days helping people remove trees from their homes and yards. And hordes of athletes from every sport have been fixtures in the most desperate areas, handing out water and food, and—most significant—simply listening to stories of survival and loss. So far the athletic department has donated more than $1 million to the relief effort. But more money will undoubtedly pour into Tuscaloosa when the Crimson Tide football team hosts Kent State for the Sept. 3 season opener—an event fans in T-town start anticipating the minute the previous season ends. "When people come to that game, if they haven't been here since the tornado, they'll see that this community will need a lot of support for a long time," Saban says. "Hopefully, an indirect thing—a football game—will lead to a direct thing: more help for Tuscaloosa." The night of the tornado Saban hosted a dozen confused, fear-stricken students at his home in Northport. His daughter, Kristen, is a Phi Mu—and a sorority sister of Ashley Harrison's. All through the night, Harrison's friends huddled in the Sabans' living room texting, calling and sending messages on Facebook, trying to determine if she was O.K. Even as the morning sun rose over a radically changed Tuscaloosa, the young women continued to reach out to their friend. Saban joined them at 5:30 a.m., taking a seat in a reclining chair. They prayed for the best. 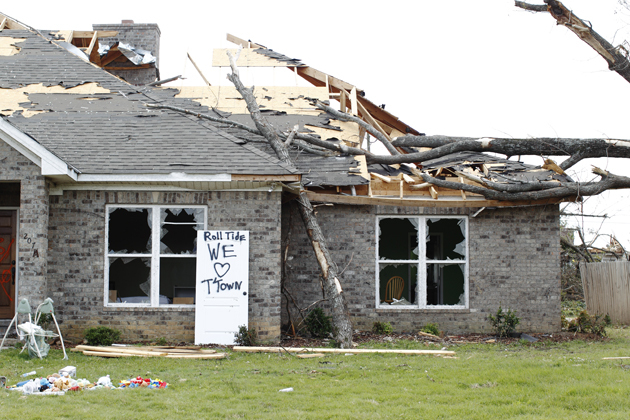 It's been two weeks since the Tuscaloosa tornado struck. In the field across from where Carson Tinker's house once stood are three small wooden crosses marking where the wind had left the three victims of 611 25th Street—one for Tinker's dog, one for Harrison's dog and one for Harrison. Her body was found on the morning of April 28. She died of a broken neck, with barely a mark on her. About 100 yards from the three crosses someone has nailed a crimson-and-white University of Alabama flag to the trunk of a tree that had been split in half. Brandon Gibson, a rising senior wide receiver, is standing close to that flag fluttering in the warm spring breeze. He was one of several Tide football players to search for survivors in the immediate hours after all hell was unleashed on Tuscaloosa. Surveying what's left of Tinker's house—a few bricks, a few books on the ground, a lawn chair—his voice cracks as he speaks. "You look at Carson's place and you wonder how he's still alive," he says. "Ashley was such a wonderful girl, beautiful, always smiling, the kind of girl you wanted to be around. I look up to Carson. He's such a positive guy and he's so strong. I go up against him every day in practice because I have to block the long snapper, and he's just damn tough. But all of us athletes are going to have to be tough in the next few months. We can help carry this community. We can give them something to be proud of, give them something that can bring us together as one. We are going to be there for them, and we are going to work our butts off for the people of Tuscaloosa. We're going to help bring this place back." "I'm just one story," said Tinker, as he limped down a hallway in Bryant-Denny Stadium last week. He's rehabbing with Dr. James Andrews in Birmingham. He will be physically healed this fall, but not even he knows where he'll be emotionally. "Soon I'm going to go visit a 10-year-old kid who lost his mom, dad and sister in the tornado," he says. "Think about that. There have been just so many people affected by this thing. It snuck up on us so fast. All we had time for was to run to the closet. We had no warning." Three days after the tornado Tinker's mother, Debbie, pushed him in a wheelchair down a hall in the DCH medical center in Tuscaloosa. He wanted to leave his room for a few minutes and get a snack from a vending machine. He knew that Ashley was gone and he was suffering from nightmares, but his identity as an Alabama football player was still intact. He was wearing a crimson-colored Alabama T-shirt. Before Tinker and his mother reached the machine, a female hospital employee approached. "We've got a lot to look forward to this fall," the employee told Tinker. And just then at DCH, where nearly 1,000 residents were treated for tornado-related injuries, Carson Tinker did something that he'll never forget, something that he hadn't done since the nearly 200 mph winds ripped apart his life and the lives of almost everyone in Tuscaloosa.